Wikipedia continues to be a favorite source of prior art references for inventors filing patent applications with the U.S. Patent and Trademark Office. The number of issued U.S. patents that cite Wikipedia articles increased by 26.3 percent in 2011, reaching an all-time high of 2,425. This is roughly one percent of all patents issued in 2011, a small but growing fraction. 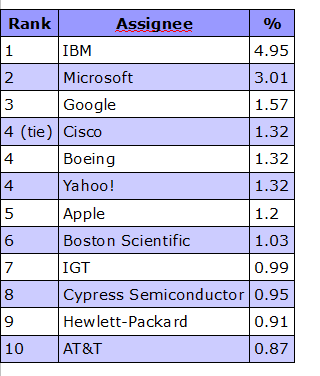 The top ten assignees shown in the table below hold approximately 17.65 percent of the 2011 patents that cite Wikipedia, which is off 5 percent from 2010. Once again, ICT firms dominated the top ten, which suggests that computer and telecommunications patents are more likely to cite Wikipedia than patents related to other technologies. The top three assignees (IBM, Microsoft and Google) account for nearly 10 percent of the total. Google jumped from 7th to 3rd place. Apple, which was in the top three last year, dropped to 5th place in 2011. 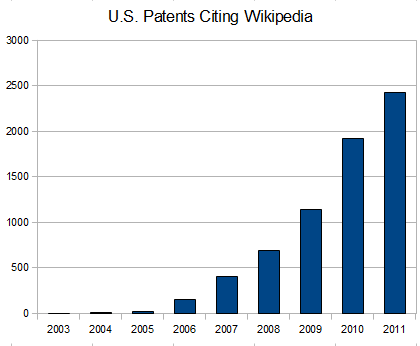 Approximately 5 percent of the patents citing Wikipedia were unassigned, which is unchanged from 2010. 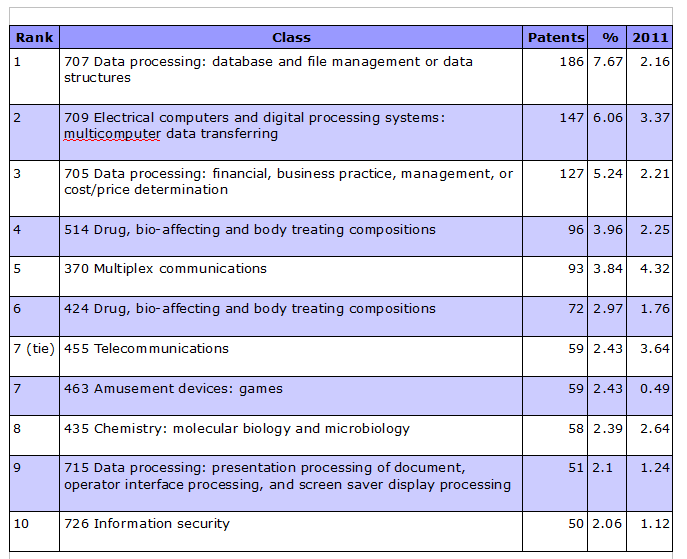 The second table below shows the top ten primary U.S. patent classes assigned to patents that cite Wikipedia. Unsurprisingly, the majority of the classes relate to information and communication technologies (ICT). However, four classes in the top ten, 514, 424, 435 and 463, cover technologies (pharmaceuticals and games) not directly related to ICT. In most cases, the percentage of patents in each class that cite Wikipedia exceeds the percentage of patents in that class. For example, Class 707 accounts for 7.67 percent of the patents that cite Wikipedia articles but only 2.16 percent of all patents issued in 2011. This entry was posted in Patent references, Prior art, Wikipedia. Bookmark the permalink.